Stress. It is everywhere around us. Even worse, it gets inside us: sapping our energy, undermining our health, and making us more vulnerable to anxiety, depression, and disease. Now, based on Dr. Jon Kabat-Zinn's renowned mindfulness-based stress reduction program, this groundbreaking book shows you how to use natural, medically proven methods to soothe and heal your body, mind, and spirit. By using the practices described within, you can learn to manage chronic pain resulting from illness and/or stress related disorders...discover the roles that anger and tension play in heart disease... reduce anxiety and feelings of panic...improve overall quality of life and relationships through mindfulness meditation and mindful yoga. 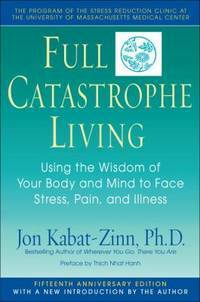 More timely than ever before, Full Catastrophe Living is a book for the young and the old, the well, the ill, and anyone trying to live a healthier and saner life in today's world.From the Trade Paperback edition. Delta. Paperback. GOOD. Spine creases, wear to binding and pages from reading. May contain limited notes, underlining or highlighting that does affect the text. Possible ex library copy, thatâll have the markings and stickers associated from the library. Accessories such as CD, codes, toys, may not be included. Random House Publishing Group, 1990. Paperback. Acceptable. Disclaimer:A readable copy. All pages are intact, and the cover is intact. Pages can include considerable notes-in pen or highlighter-but the notes cannot obscure the text. At ThriftBooks, our motto is: Read More, Spend Less.Dust jacket quality is not guaranteed. Random House Publishing Group, 1990. Paperback. Good. Disclaimer:A copy that has been read, but remains in clean condition. All pages are intact, and the cover is intact. The spine may show signs of wear. Pages can include limited notes and highlighting, and the copy can include previous owner inscriptions. An ex-library book and may have standard library stamps and/or stickers. At ThriftBooks, our motto is: Read More, Spend Less.Dust jacket quality is not guaranteed. Random House Publishing Group, 1990. Paperback. Good. Disclaimer:A copy that has been read, but remains in clean condition. All pages are intact, and the cover is intact. The spine may show signs of wear. Pages can include limited notes and highlighting, and the copy can include previous owner inscriptions. At ThriftBooks, our motto is: Read More, Spend Less.Dust jacket quality is not guaranteed. Random House Publishing Group, 1990. Paperback. Acceptable. Disclaimer:A readable copy. All pages are intact, and the cover is intact. Pages can include considerable notes-in pen or highlighter-but the notes cannot obscure the text. An ex-library book and may have standard library stamps and/or stickers. At ThriftBooks, our motto is: Read More, Spend Less.Dust jacket quality is not guaranteed. Delta. PAPERBACK. 0385303122 Ships quickly. Mild to moderate wear. Orphans Treasure Box sells books to raise money for orphans and vulnerable kids. . Good. Delta. PAPERBACK. 0385303122 Ships quickly. Mild to moderate wear. Slight moderate tanning edges. Orphans Treasure Box sells books to raise money for orphans and vulnerable kids. . Good. Delta. Used - Good. Ships from Reno, NV. Shows some signs of wear, and may have some markings on the inside. 100% Money Back Guarantee. Shipped to over one million happy customers. Your purchase benefits world literacy! Delta. Used - Very Good. Great condition for a used book! Minimal wear. Delta. Used - Good. Former Library book. Shows some signs of wear, and may have some markings on the inside. Delta. Used - Very Good. Ships from Reno, NV. Former Library book. Great condition for a used book! Minimal wear. 100% Money Back Guarantee. Shipped to over one million happy customers. Your purchase benefits world literacy! Delta. PAPERBACK. 0385303122 ~Good. Light to moderate shelf wear to covers/corners. Trade paperback binding. Support Last Word Books & Press and other independent booksellers. For more information about a specific title please feel free to contact us with your questions. . Good. Delta. PAPERBACK. 0385303122 Good. Light to moderate shelf wear to covers/corners. Trade paperback binding. Support Last Word Books & Press and independent booksellers. . Good. Delta, 1990-06-01. Paperback. Very Good. Book is in very good condition, cover has minor wear along the edges. Delta. PAPERBACK. 0385303122 Crisp pages. Tight binding. Light shelf wear on cover. Light tanning. Sun fading. . Very Good.